LONDON: England were left looking like smiling idiots just happy to be at the party, Britain's newspapers said Saturday after their humiliating early exit from the World Cup was confirmed. With England's tournament in Brazil over -- Costa Rica's 1-0 win over Italy on Friday making their survival mathematically impossible after two defeats -- the press began casting about for scapegoats. The Daily Mail said it was "bloody insulting" for the FA to declare Hodgson safe in his job so quickly. Greg Dyke, "the erratic FA chairman, decided it should be the very day for him to declare his public support for his manager in what looks like a Sepp Blatter-esque display of disengaged buffoonery. "He might as well have said: 'Who cares about the fans anyway, I'll just do what I want and sod the lot of you'. The paper added: "This is as good as it gets. This is what we must expect. This is who we are now. The smiling idiots just happy to be at the party. "Dyke talks blithely of winning a World Cup in 2022 but his is an organisation devoid of ambition." The Daily Telegraph said the FA should apologise to England's fans. "They think it's all over. It is now. How those words haunt England," the broadsheet said. "The national team's latest failure... demands an apology from the FA, Roy Hodgson and the players. 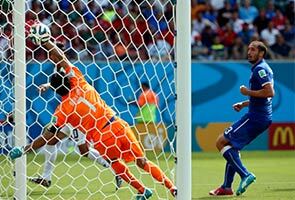 "The fans did not expect much, but they expected more than this; at least give them the inevitable pain of penalties. But this was humiliating, being turfed out of this wonderful party before they had hardly tasted their first caipirinha." The Guardian said the "familiar search for scapegoats and answers" was under way as it tried to work out how to apportion blame. "England's biggest names failed to ignite," it said. Meanwhile "the Premier League paradox -- its huge success as a global product having squeezed the chances of young English players -- is only getting worse". The Times said there was a lesson to be learned somewhere in the debacle, and it was hard to argue that English football's structure was better than Costa Rica's. "Some problems are not solved by money, by state-of-the-art facilities, by flooding the country with coaches," it said. "Some problems, such as a failure to conserve possession, are more deep-rooted. Until those issues, cultural and knotted, are solved, the country can kiss any hope of success goodbye." The Independent said the FA was using the only tactic it hadn't tried yet: standing by an England boss. However, Hodgson had the "classic demeanour of the diminished England manager: the colour drained from his skin and the grey FA suit evoked an Englishness that owed more to (1990s prime minister) John Major than James Bond." The Sun said it might be the end of the World Cup, but it was not the end of the world, urging readers to sing Monty Python's "Always Look on the Bright Side of Life".